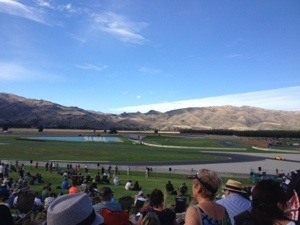 I had the absolute pleasure of attending the Grand opening of the Highlands Motorsport Park in Cromwell over the Easter weekend. I personally could not fault it and I’m extremely excited to have the opportunity to offer the FreemanX Supercar Experience to those in the South Island and those traveling to the Queenstown region. It’s a credit to Tony Quinn (the track owner) and his team for delivering such superb facilities in such a short space of time. What a great development for Cromwell, the greater Queenstown region, and New Zealand as a whole. It was only a few years ago that Tony Roberts and Chris Watson brought their dream to reality with the opening of Hampton Downs Motorsport Park in Meremere, this feat deserves special credit given the financial obstacles faced and the unbelievably draining and expensive process of resource consent they spend years battling. I am very grateful for their determination and personal sacrifice to establish Hampton Downs without which we would never have had the opportunity to launch FreemanX Supercars. What would it mean to you if you won lotto? How would your quality of life change? If you desire money because you feel it will be the answer to all your problems, it won’t. It will simply shift you along the social ladder giving you prettier problems. It’s all relative. A child who is starving in a third world country with no access to education, medical care, or society as we know it has problems very different to ours. They would of course consider the life lived by our poorest citizens to be one of absolute luxury , wealth, and privilege. In the same light those individuals that we perceive to have ‘everything’ – wealth and fame… they too have problems relative to their lives. There will always be masses of population with real world circumstances far worse than ours and many people with real world circumstances far better than ours. Yet interestingly the range and intensity of emotions we attach to our struggles and challenges appear to be the same. It’s all relative. The man who has no legs appears to apply the same intensity of emotions dealing with his challenges as the famous celebrity does dealing with having gained 2lbs. It’s all relative. In business money is very important, it’s the key currency of performance, the measure of how you are progressing as an entity, a benchmark for how good you are. However that’s not the case in our personal lives. Why do people want money? They don’t want pieces of paper, they want the things that money can buy right? And why do people want the things that money can buy? Well it’s because they want the positive emotions they feel will come from acquiring those things… contentment, pride, stature, happiness, empowerment, sense of freedom. .. ultimately in life what we are all pursuing is better quality emotions. What is the currency to our quality of life? I believe it’s our State of Mind. The better the quality of emotions we have and in turn our ongoing State of Mind, the more enjoyable and fulfilled our lives will be. To be able to control our State of Mind is to grant ourselves the power to transcend the relatively of problems and dictate our own quality of life no matter what our social situation or level of financial wealth. We often hear about those rich or famous suffering depression. We also come across those with very limited financial means that seem so happy and full of life and love. These of course aren’t generalisations or an attempt to link one thing with another, rather instead to again highlight that our State of Mind is ultimately not controlled by the level of financial wealth that surrounds us. But don’t get me wrong, financial wealth is a legitimate and worthy goal to pursue as are many things in life. Just don’t let it be a condition on your right to enjoy life right now, that is a right I believe we are all inherently bestowed. By better understanding what controls your quality of life you will come to the realisation that you need not hang on the edge of your seat hoping for a lotto win, as it is no longer the Holy Grail. You have all you will ever need to create the most fulfilling life right now. The currency of life’s true enjoyment is in our control… what a realisation, if we choose to adopt it.